Looks really nice, well done. If you just want an E11 that will pass, 99% of those build changes you see don't need to be done. You could buy the resin kit, glue it together, spray it black and call it done. The only gotcha for EIB is the rear D ring (well more of a round rect) needs to be added but I did get one in the kit, even if it wasn't great. All the mods you see people do is to make up for some of the detail loss that was needed to be able to make these castings cheaply. Things like holes and deep grooves are filled in so that there's no deep holes in the mould that are prone to tearing. The longer a mould lasts, the cheaper each casting can be. Liquid is a templating system created by Shopify to make it easier to design web shops. Anovos use Shopify to provide their web shop. Looks like there is an error in the template/software somewhere which is causing this error. Not very historically accurate though, no horns on a viking helmet. This is a CRL thread after all! Welcome to the FISD! UK wise there's a pretty decent amount of choice but it can all be sourced here, some of the best armour is UK made. The biggest price variable is the kit but the reality is you're going to be in the £800-£1500 ish range depending on exact decisions you make. I think mine was about a grand but I didn't keep and exact cost recorded. Whilst this accuracy is all well and good when it comes down to it, this is not a replica group. I don't feel we should be enforcing the exact angle of the ear or brow height at anything less than Centurion. Troopers should, for the most part, look the same. 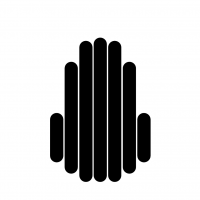 If we're down to such minutiae as the brow gap being 5mm off or the ears being off by ~10° then I'd suggest we're already doing a pretty decent job. Provide the information, those who wish to built to it will always exist but I don't feel this level of detail should be overly enforced. You’d need to use a translation guide, these ones came from what troopers have been using for a while. http://models2u.co.uk/downloads/PaintChart-RtoH.PDF That looks to have all the colours listed but you’d need to test them to be sure. The trimming can be done with just a Stanley knife if needed, ideally you’d have a metal rule too for straight lines. Wilko do a cheap aluminium one. The knife it’s self is what ever you can get, a pound land one will do. You don’t need to press hard just let the knife score, do a few passes and flex it to snap along the score line. If you can some curved lexan scissors from eBay will be about another £4 and help massively in some curved areas where it’s a pain to use score and snap. The only other thing you will want it’s some 180 sand paper. Once each edge is cut run some over to smooth off any sharp edges. Anything more than this isn’t needed. It may speed things up or make it easier but it is not needed. Matt is spot on. Looks like you didn't trim down the mouldings to just he plates before attaching them. Apparently the talk was videod by our GML I was up first, I had no briefing about what to expect other than there was stairs to be careful on, and nearly missed on the way off. Troop #15 - 24 November 2018 - MCM ComicCon Birmingham (approx 5 hours in armour) A few firsts for me on this one: First time at the Birmingham Comicon, First time I've talked the wife in to coming along in an official capacity and also the first time away with out the kids in over 5 years! Day started with our briefing taking place on the main stage with use of the PA, this was a novel change from someone shouting across the changing room. After this the wife was whisked away for her induction briefing (safety talk and basics of spotting) so I didn't see her again until mid morning. MCM ComicCon Birmingham Between the UKG, Reel Icons, Rebel Command, Rebel Legion, Mando Mercs, 15th Cyber Legion, UK Colonial Marines and the UK Predators we had over 300 costumers plus a number of spotters. This was a record as far as I am aware and the presence was immense. First thing in the morning you couldn't not see a group of the costumers out working the crowd. IMG_6MCM ComicCon Birmingham583 Also new for me I volunteered to take part in a talk by our CO Garry Hales (also LXO) about the UKG/Reel Icons/Rebel Command and what we do from both a costuming and charity point of view. I was first up on stage, easier said than done there was a step, and was on stage for a few minutes and all the details of the costume and blaster where pointed out to the crowd. I was quite proud that the crowd was noticeably larger by the end of my bit, and that nothing fell off I was followed up by a snowy, an OT and FO Tie, Lord Vader, some stage invading Jawa, Batman, Iron Man and 2 Judges from Dredd(2012). Whilst it was only a small stage by the end of our talk it was a full crowd with many standing as well. Very proud to be part of that. MCM ComicCon Birmingham One of the big draws for MCM Birmingham is the big group photo. Sadly due to the size of the crowd (there were also other shows on at the venue) and the huge number of customers the normal ramp wasn't able to be used so we used the queue hall for a big wide shot. The final image for this is HUGE so rather than kill everyones bandwidth I'll add a video taken by our GWL Wayne Allen TK 52517 During a break my wife noticed a few cracks forming on my armour, one of which risked snapping a corner off the button plate on my chest. Rather than risk losing the corner I elected to de-kit for the day. I spent the rest of the day looking after the Rogue One team consisting of Director Krennic, 2 Death Troopers, 2 Shore Troopers an a Jyn. Having a nice sized group of R1 costumes together really gave a nice big impact MCM ComicCon Birmingham These guys were also cool, I guess. 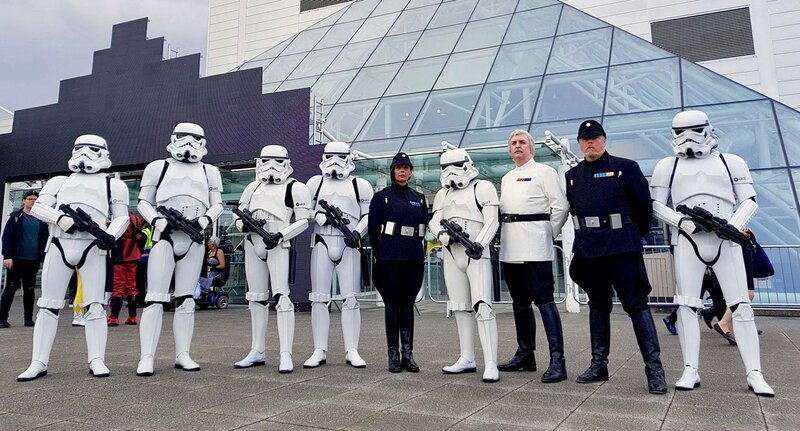 MCM ComicCon Birmingham These are members of our Reel Icons club, most/all are also 501st members 1 is an LCOG. Me not update my troop report in a timely manner, how very dare you. Troop #14 - 27 October 2018 - MCM ComicCon London (approx 8 hours in armour) Yup back at the Excel again for another Comicon. For the most part this one was business as usual. An early start to entertain the queues and then patrols of the venue. Late in the morning I was part of the group who took part in a Silver Sabers display. We paraded in to their stand so that Lord Vader could preside over a sabre battle display. At the end we the paraded back out, and went for lunch This picture was us lurking in a hall entry way waiting for the display time. The ladies were from our guest charity, Mitchell's Miracles, who were collecting on the stand for the 3 days of the con. London Comic Con October 2018 This is a cut from some video, complete with badly timed trooper looking to the side The afternoon was much of the same with a few stints on the club stand for photo-ops by the Death Star wall. Day was called when a spotter noticed I was getting "trooper legs" with about an hour left of the con. Armour did sterling service but on the way out of the venue I was thanking a spotter for help with the lift doors when some one opened a door into my helmet bag! The damage wasn't too bad, about 1/2 long maybe a touch more along a tube seam. 20 minutes with some T shirt and super glue and I was ready for the next one. Welcome to the FISD, glad you enjoyed Birmingham and sounds like Marc did a good job if you're here! As Dan has said do make sure you head over to http://www.ukgarrison.co.uk/join-us.html and get the ball rolling there also. Hi Jack, I don't know of anyone off the top of my head but there's a fair few members down Bristol way who may well be able to help you if needed. Head over to the UKG and ask there. If you've not done so you will need to to create your WIP thread there for clearance anyway. Good luck trooper. Chris. That link is in the members only area I am afraid. As for The shed/DA if you like them there is no reason to go with them. Lots of happy troopers in that kit all over Europe. As Mathias has said, he may have made them but a lot of the claims and information on his site are just plain fabrication. There's plenty on this subject if you search. themaninthesuitcase replied to DStep's topic in Getting Started - Read this First! Whilst I’m not trooping the Sunday I’ll be about in the morning as joe public so I might well see you. Woo I’m image #3! And I’m about as organised as you are, I’ve not done mine for this troop yet either. Scammers like this make their money by people buying the rubbish. By even buying it even if you will refund it you’re helping them win. These scams are popping up a lot at the moment. A surprisingly large number people always say “well it’s worth a go” or “I wonder what you do get”. It’s obviously worth their while. The only winning move move is not to play.